How High Can Monster Beverage Fly? Shares of Monster Beverage (NAS: MNST) hit a 52-week high on Friday. Let's look at how it got here and whether clear skies are ahead. Monster has taken its share of energy drinks this year, charging past its more traditional competition. As hard as they try, Coca-Cola (NYS: KO) and PepsiCo (NYS: PEP) haven't been able to take hold of the energy market that's dominated by Monster, Red Bull, and 5-Hour Energy. Financially, the results have been outstanding. In the fourth quarter, revenue grew 28.4% to $467.3 million, and net income rose 31.4% to $64.5 million. This has translated into market-beating returns over the last year for investors as well. Monster is by no means a cheap stock at this point, trading at 43 times trailing earnings, but the company has a long history of growth. The only problem is that when you're trading at that level, the market has perfection priced in, and Monster doesn't have as diverse a product line to fall back on as Pepsi or Coke do. The company will have to continue growing at a rapid pace for the stock to stay at its new high. I don't see an end to Monster's growing ways as it expands its product line and the energy drink business grows. New international markets are starting to open up and that should fuel the next wave of growth. The one concern I have is the premium that the stock is trading at, although it's something Monster and its old incarnation Hansen Natural are used to. I'm cautiously optimistic the stock can move higher, but not confident enough to make a CAPScall right now. 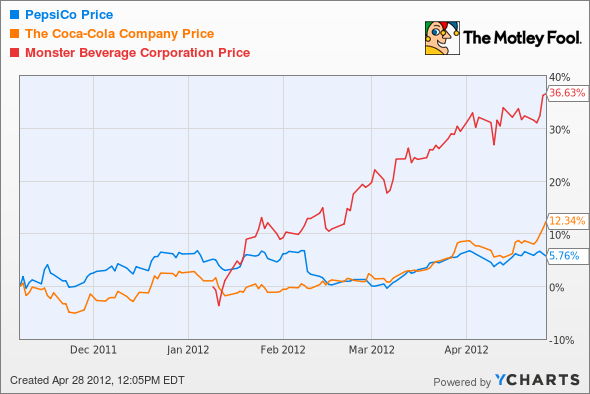 It may not be as exciting, but I like Pepsi with a 16 P/E ratio and a 3% dividend over Monster at its current price. Interested in reading more about Monster Beverage? Click here to add it to My Watchlist, which will find all of our Foolish analysis on this stock. At the time this article was published Fool contributor Travis Hoium does not have a position in any company mentioned. You can follow Travis on Twitter at @FlushDrawFool, check out his personal stock holdings or follow his CAPS picks at TMFFlushDraw.The Motley Fool owns shares of PepsiCo and Coca-Cola. Motley Fool newsletter services have recommended buying shares of Coca-Cola, PepsiCo, and Monster Beverage, as well as creating a diagonal call position in PepsiCo. The Motley Fool has a disclosure policy. We Fools may not all hold the same opinions, but we all believe that considering a diverse range of insights makes us better investors. Try any of our Foolish newsletter services free for 30 days.